Clean up unnecessary files that slow down performance of your computer. 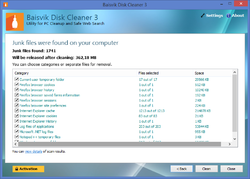 Baisvik Disk Cleaner 3.3.7 was available as a giveaway on April 3, 2018! Utility for disks cleanup from unnecessary files that slow down performance of your computer and occupy disk space without any sense. You don’t need to worry about your data, since the program is absolutely safe and allows you to remove only really junk files. 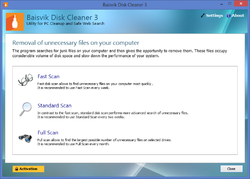 Baisvik Disk Cleaner allows you to protect your Internet privacy, optimize your computer, and release considerable space on the disk. Thanks to user-friendly interface, the program can be used by both professionals and inexperienced users. 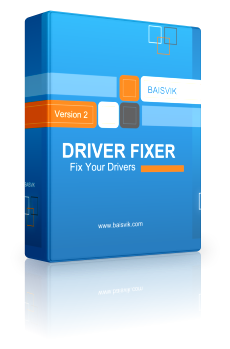 How would you improve Baisvik Disk Cleaner 3.3.7? Fix the problems with your PC and hardware in just one click! If you have any problems with your PC or external devices, you need to fix and update drivers. When you install or uninstall any program, connect and disconnect a variety of devices to your computer, surf the Internet, drivers on your computer can be damaged by improper operation of programs and actions of viruses. As a result, you can observe a slow and unstable functioning of your computer, video, Internet, printer and other equipment. Your PC started running slowly and unstable? You are tired of waiting for a few minutes the usual start of an application? If you recognize any of this, don't worry! There are numerous reasons for slow PCs, besides any computer eventually becomes less effective. This means that your computer needs professional help! Over time, the registry of your computer gets clogged and damaged as a result of the various programs running on your PC. In addition, various programs run at Windows startup. These issues might slow down your computer's performance. 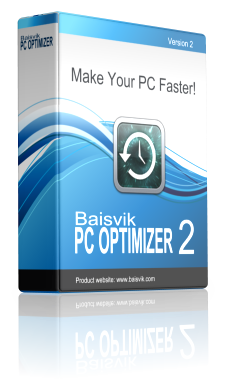 PC Optimizer helps to fix these problems and restore your computer to its normal state. To avoid it starts with windows: remove the baisvik cleaner job created in windows task scheduler and from task manager, start-up (Win8 onwards). Hi everybody. :-) Suggestions for the developer/s (if he/they read/s here…): – add an option “start with windows” – Offer a portable version – Offer maximize/minimize buttons (full screen) – Allow your users to customize paths and files (i.e., I would add my preferred paths to be cleaned) To avoid it starts with windows: remove the baisvik cleaner job created in windows task scheduler and from task manager, start-up (Win8 onwards). A few helpful comments, but I can't believe how rude people can be on this site. Someone asks a question related to the program being offered and to what that program claims to do, and gets ridiculed for it. I used to like this site, think I'll quit showing up for a while and hope things get better. Maybe all the developers will do the same. Seems that are a lot of morons just saying their meaningless opinions without having any knowledge on the subject whatsoever. This program is with a permanent license, installs very easy and fast, has a very good ratio of finding obsolete and junk files and most importantly cleans fast. The CC cleaner was from several years ago hacked and its capability of actual cleaning is close to zero. So to the morons keep using CC cleaner, and to the knowledgeable people use this program as it has a good balanced ratio on cleaning and quickness, without impacting on the system's overall performance. Steven, if it has no impact on the system's overall performance, of what use is it? Steven: a 'moron' is easily identified by his / her inability to check even a basic fact before pronouncing on this, that, or the other. You might like to check yours. Steven, actually, CCleaner was hacked only last summer and quickly fixed. Many "morons" continue to use it, and continue to report that it is still one of the best cleanup utilities available. Steven, CC Cleaner is kept up to date with regular revisions. Furthermore the few versions that were affected by malware were quickly patched and are no longer any kind of issue. So to use it does not require anybody to be a moron and there are many millions of users that benefit from it every day. It would have helped in your own conclusion if you had made some specific comparisons so that your claims about balanced ratio on cleaning and quickness, without impacting on the system's overall performance could be ratified. As it stands, your comments seem more akin to somebody with specific interest in promoting this particular product. Steven, CC Cleaner is kept up to date with regular revisions. Furthermore the few versions that were affected by malware were quickly patched and are no longer any kind of issue. So to use it does not require anybody to be a moron and there are many millions of users that benefit from it every day. It would have helped in your own conclusion if you had made some specific comparisons so that your claims about balanced ratio on cleaning and quickness, without impacting on the system's overall performance could be ratified. As it stands, your comments seem more akin to somebody with specific interest in promoting this particular product. Steven, I take it you are not knowledgable then? As real knowledgable people know where unecessary persistent files that should only be temporary accumulate and which are safe to delete and which are not... I trust my own knowledge over any 3rd party developer that I'd have to vet their programs intentions every time just to protect my systems integrity and all my programs licenses. reghakr, and Wise Registry Cleaner Free. Baisvik wrote: "...cleanup from unnecessary files that slow down performance of your computer..."
Question: How can an unnecessary file slow down a computer if never is in use and furthermore, if those are temporary files, they get recreated every time you start a new computer session and in reality, can never be removed from the system? Baisvik wrote: "...cleanup from unnecessary files that slow down performance of your computer..." Question: How can an unnecessary file slow down a computer if never is in use and furthermore, if those are temporary files, they get recreated every time you start a new computer session and in reality, can never be removed from the system? No way I am installing a program that MUST be included in your Startup Programs. is the instant I walk away. Nothing in those 'awards' explains why this cleaner is rentalware, because nothing in those 'awards' persuades that the developer has much in the way of credibility. <b>kui_, </b> Just to say: these comprehensive reviews of yours really are greatly appreciated. You take the time, and the trouble, to delve deep and then report back here. You're a gem. 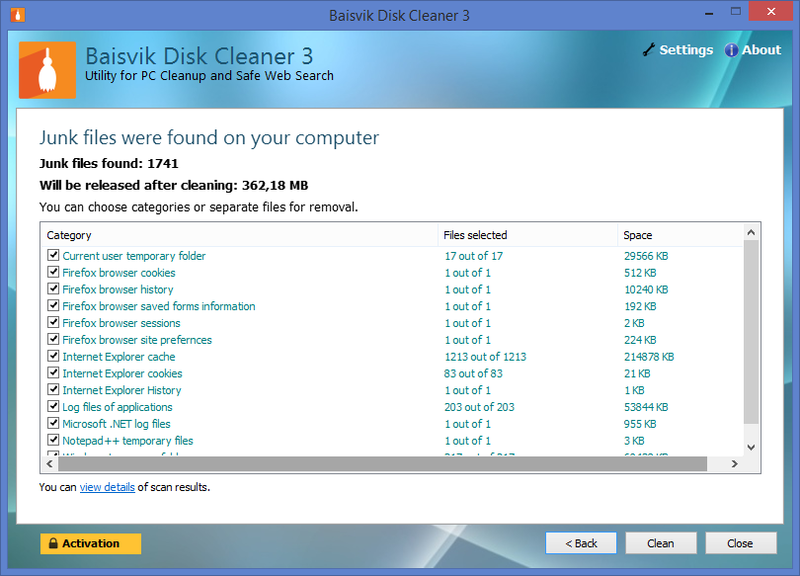 As to this software, and notwithstanding your efforts, the instant I see a page of "awards" as daft as this: http://baisvik.com/en/products/baisvik-disk-cleaner/awards is the instant I walk away. Nothing in those 'awards' explains why this cleaner is rentalware, because nothing in those 'awards' persuades that the developer has much in the way of credibility. MikeR, thank you, much appreciated. Tbh, i never take a look at other reviews or tests, in order to not spoil the good or bad, that includes awarded sites. In regard to those awards, i completely agree with you. Most people probably never heard about the program before at all or the company that is. paul, "Disk Cleanup". I also use that from time to time. Are they the same company that 'provides' the browser hijacker of the same name? Dimma, Sounds like it is better than CCleaner, will give it a try. thanks. windows , its so user friendly but comes at a heavy cost. Dimma, windows , its so user friendly but comes at a heavy cost. AR, Dimma is NOT making any claims about todays giveaway product Dimma is asking questions about sensitive folders on a windows PC that should not be messed with algorithimicly or even by an expert if you want windows to remain FULLY functional. e.g. SFC /SCANNOW will always fail if you delete files in the winsxs database to scrimp on space. Which will make a vital repair tool in any technicians tool belt inoperative! 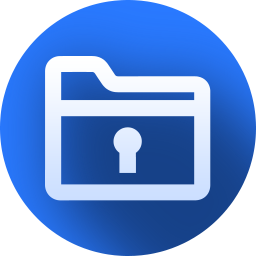 One commonly asked question is, "Can I delete the WinSxS folder to regain some disk space?" The short answer is no. Deleting files from the WinSxS folder or deleting the entire WinSxS folder may severely damage your system so that your PC might not boot and make it impossible to update. TK, Thanks. I assumed this tool can scan and remove obsolete copies (update leftover). After my morning coffee, I realized this was already handled with the built-in 'disk cleanup' tool. And true, all these tools offer destructive options, CClean included. one needs to know what is going on. TK, Thanks. I assumed this tool can scan and remove obsolete copies (update leftover). After my morning coffee, I realized this was already handled with the built-in 'disk cleanup' tool. And true, all these tools offer destructive options, CClean included. one needs to know what is going on. TK, Then "Glary Utilities" (Glarysoft) will be suitable for me. 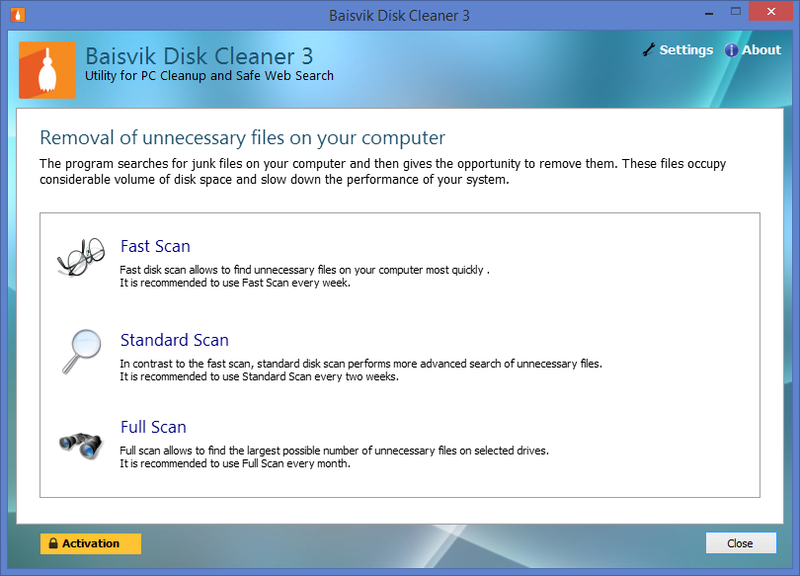 Or "Baisvik Disk Cleaner" is better? TK, Then "Glary Utilities" (Glarysoft) will be suitable for me. 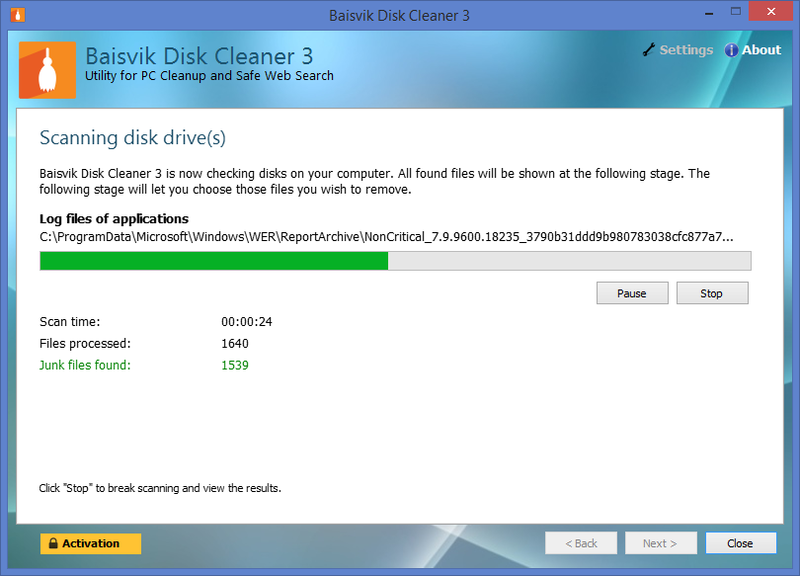 Or "Baisvik Disk Cleaner" is better? you forgot to mention that C: should be reformatted before deletion. Jerry Mahony, you forgot to mention that C: should be reformatted before deletion. Ootje, "Disk Cleanup". I use that from time to time. More than enough to keep your PC clean. I have no other cleaners on my PCs. Ootje, "Disk Cleanup". I use that from time to time. More than enough to keep your PC clean. I have no other cleaners on my PCs. TK, "Disk Cleanup" from Windows...That is more than enough to keep my PCs clean. I use that from time to time. Other cleaners, no way. Jerry Mahony, I've found it is wiser to learn from other peoples mistakes. School of hard knocks is only the best teacher for fools and those that are unwilling to learn by others experiences or follow others obviously stupid advice... people will learn quite quickly to never follow your suggestions eh?